Architecture imitates mother nature sometimes when it comes to capricious forms defying the laws of physics. Imagine a huge tree with a thick trunk and a heavy load of foliage on top. Picture yourself taking a closer look to its base: a dense laberynth of arched roots that know nothing about calculus, geometry or physics deadening the enormous weight, spreading the charge and making a bigger base. Now take all that draw it on a plane without Autocad or Maya. Don´t get scared, you can´t but Gaudi did. He didn´t invent the buttress and prop systems as they were widely used in cathedrals before but he took it to a mathematical perfection. I already have this image published at Flickr but I wanted to share it with you that appreciate art and are eager to know more about each other's cities. This is quite an amazing shot. Wow. I would love to come look at some of this archetecture. Hola Carlos, Gaudi's work is indeed fascinating. Interesting analogy between the structure of the cathedral and the trunk of a powerfull tree. 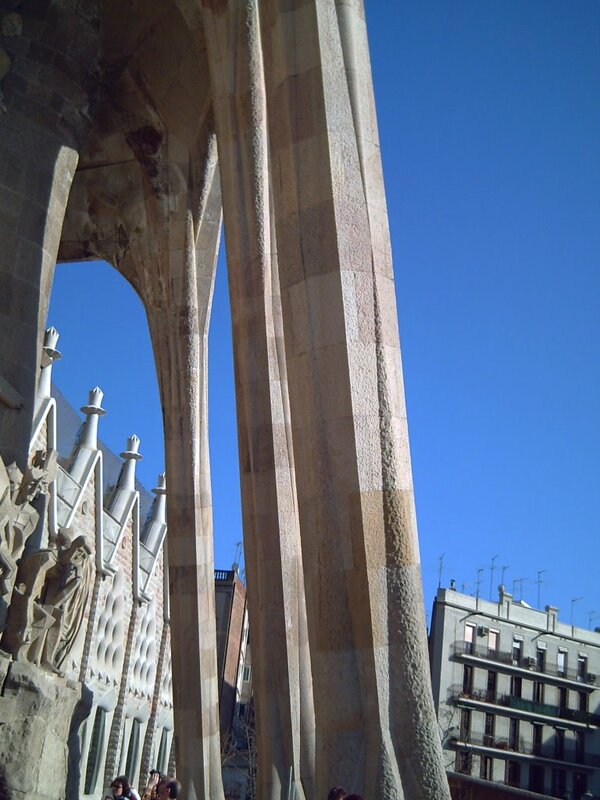 You seem to be well-versed in architecture, and Barcelona is a great place for that!